Warm up your wardrobe staples. 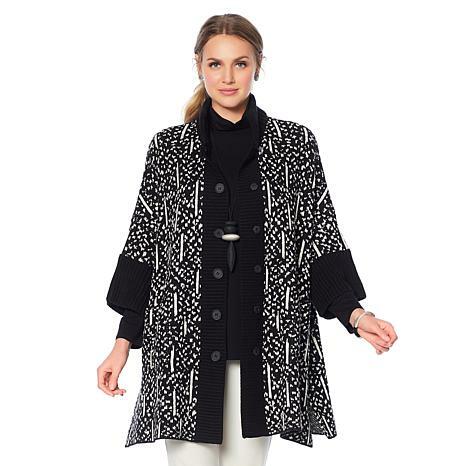 This sweater gives you the structure you love in a coat but in a soft and cozy knit. With pockets for stashing your essentials, or for keeping your hands comfy, this topper is the one you'll reach for in place of blazers, moto jackets, and trenches. Fit: Very Loose-Fitting: Designed for 7 or more inches of ease between body and garment. Measures at least 7" larger than the fit-critical body measurement. Cut very full for complete ease of movement and fabric drape. Like her clothing. Made well and looks good very flattering. Comfortable. I go down a size in this line like this too. I ordered two of these, one for myself & one for a friend who always admires my Marla Wynne pieces. She will be happy on her birthday & I am happy with the clearance price! Love it!!!!! Classy, warm and well made. Love the snap closure. I finally ordered the sand color in small and the fit is perfect. I wanted the charcoal color but it was sold out but I am on the wait list for it and I so hope I get it. This topper is beautiful and the knit is so soft. The quality is excellent. I love the sleeves and the cuffs. Marla, this is a winner and I love it. I am on the wait list for the charcoal so please make more. Love the shaw like fit. Very nice knit like material with warmth to it. The sleeves and the cuffs add class.